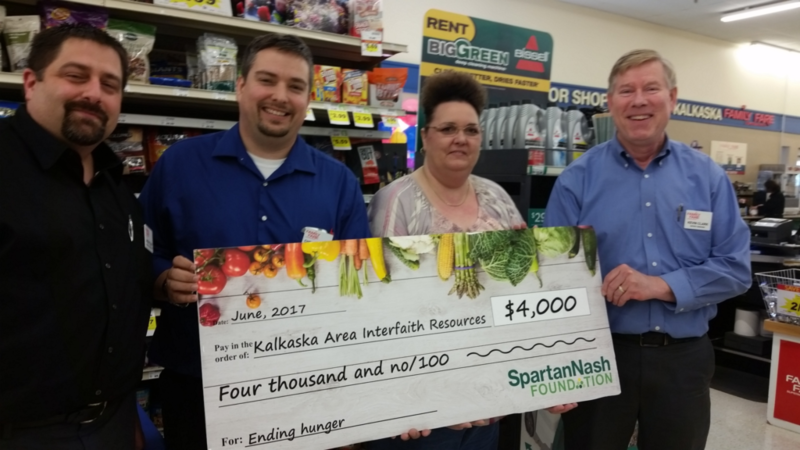 KALKASKA, Mich. – The SpartanNash Foundation today presented a $4,000 grant to Kalkaska Area Interfaith Resources. The donation – which took place on June 30 at the Kalkaska Family Fare, located at 784 S. Cedar – will go toward the purchase of a commercial freezer, which will allow KAIR to keep more food products on site for families in the Kalkaska area experiencing food insecurity. Kalkaska Area Interfaith Resources (KAIR) is an interfaith, community-based volunteer program that provides practical assistance to the qualified elderly, frail, isolated and needy of Kalkaska County. Services include a food pantry, utility assistance and a resale store. KAIR provides food to approximately 700-900 people each month in the Kalkaska area. Currently, families receive food monthly from the food pantry. With the purchase of a commercial freezer, KAIR’s goal is to provide food twice monthly to these families. From left: Kalkaska Family Fare Assistant Store Director Jason Elsey, Store Director Chris Wilson, KAIR Executive Director Cathy Somes and SpartanNash District Manager Kevin Clark. Presenting the $4,000 grant to KAIR Executive Director Cathy Somes on behalf of the SpartanNash Foundation were Family Fare Supermarket Store Directors Chris Wilson (Kalkaska), Rocky Welch (Traverse City) and AJ Swander (Manistee), as well as Kalkaska Family Fare Assistant Store Director Jason Elsey and SpartanNash District Manager Kevin Clark. SpartanNash owns and operates the Family Fare Supermarkets, with the SpartanNash Foundation serving as the company’s charitable giving arm. The SpartanNash Foundation was formed in 2015 following the merger of the Nash Finch Company and Spartan Stores. It represents the best of the NFC Foundation and the Spartan Stores Foundation. The SpartanNash Foundation is the charitable giving arm of SpartanNash and is focused on providing grants to nonprofit community partners who are working to end hunger, provide shelter and support our military heroes. To learn more about the SpartanNash Foundation, visit spartannash.com/foundation.